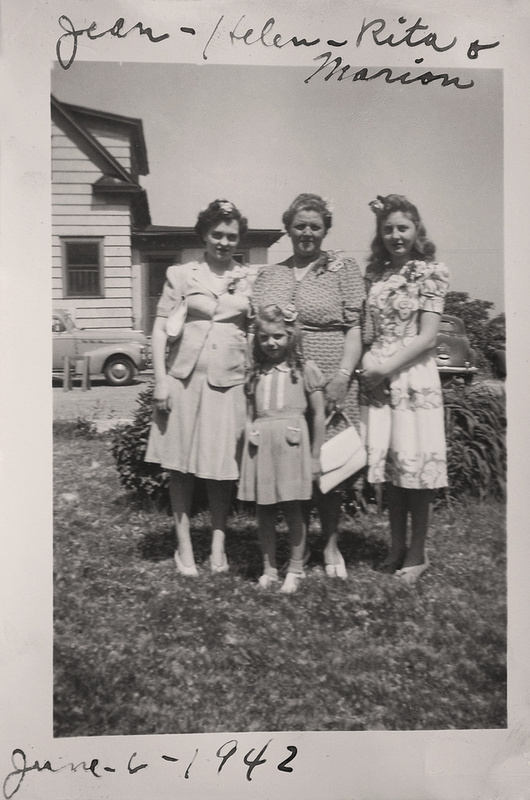 The Murosky ladies dressed up to attend the wedding of Raymond H. Bukowski and Veronica A. Karpinski on June 6, 1942. The photograph was taken in Erie, Erie County, Pennsylvania. The exact location of the photograph is unknown. Helen Tillie Bukowski, age 41, the aunt of the groom Raymond H. Bukowski. Helen is the sister of John Frank Bukowski - the grooms's father. Rita Ann Murosky, age 14, and Marian Elaine Murosky, age 6. The girls are the daughters of Helen Tillie Bukowski and are first cousins of the groom Raymond H. Buowski. The ladies included in the photograph include Mary Eugenia McDonald, age 20, wife of Arthur Murosky. Arthur is the son of Helen Tillie Bukowski and was a fist cousin of the groom Raymond H. Buowski. Mary Eugenia was expecting her first child, James Arthur, who was born in October 1942. The photograph was included in the Helen Tillie Bukowski Collection. Helen likely recorded the names on the photograph. Photographer Unknown. Editing and digital restoration by Michelle M. Murosky. Helen Tillie Bukowski is my great grandmother. She married Anthony Harry Murosky, Jr. my great grandfather. Their son Arthur Murosky is my paternal grandfather. Arthur married Mary Eugenia McDonald - my paternal grandmother. Rita Ann Murosky and Marian Elaine Murosky are my great aunts.